The Wilderness Over/Under 4 Season Down Quilt by Backpackinglight. I’ve always struggled to sleep in a mummy style sleeping bag, I tend to move about in my sleep and move my legs around occasionally sticking a leg out to regulate my temperature during my sleep (odd you say!). Having tested a number of sleeping bags of different styles I’ve never managed to find one that provide me with the warmth and the freedom of movement…until now! Quilt style sleeping bags have been around for a while and some of the top sleeping bag manufacturers all have a small range of quilts. However they come with a hefty price tag. Backpackinglight have two Wilderness Quilts, a 3 season and a 4 season version. I bought the 4 season quilt with the hope that I can use this all year round. The theory goes that you don’t get very much benefit from the compressed part of the bag that you are sleeping on, and therefore isn’t necessary (assuming you’re using a sleeping mat). By removing the underside of the bag there is a clear weight improvement and for me the biggest benefit is not being trapped inside the bag. The quilt allows me to stick a leg out if I get too hot and also allow me to pull the drawstrings in if I need more insulation creating a sleeping bag. The quilt is rectangular and is plenty big enough for me (at 6′ 2″), the quilt has hooks located down each side of the quilt and supplied with some elastic cord. This cord is treaded through the hooks crossing the underside of the quilt. Once you have your sleeping mat inflated you can pass the mat underneath the cord to secure the quilt in place. I’ve only tested the quilt in the summer months (10-15C) so I’ve left the cord loose so the edges of the quilt just sit along the edge of my mat. In colder temperatures the cord can be tightened (while inside the quilt if needed) so it pulls the edges of the quilt into/slightly under the mat. The end of the quilt can also be tightened such that it creates a foot box. The hooks can also be used to hang the quilt under a hammock as an under quilt. So for those like me who also like to occasionally hammock camp this is brilliant. The quilt is well made and looks as though it will stand up to some abuse however as its made from lightweight fabric (as with all good bags/quilts) some care should be taken to prevent rips on sharp objects. I’ve used the quilt a few times during summer and I was expecting to be far too hot given it’s a 4 season down quilt, however I was very surprised to find I wasn’t. To begin with I was disappointed, how will this keep me warm in winter? Well the reason is two fold, primarily the reason I slept at the perfect temperature this was due to being able to self regulate (leg out) and secondly due to the down filling allowing my skin to breathe and therefore regulate temperature better. *I’m yet to test this in winter so I will add a caveat that until I get a chance to testing this in 0-3C I can’t award this the full 10 stars, although I’m confident it will be plenty warm enough for winter. 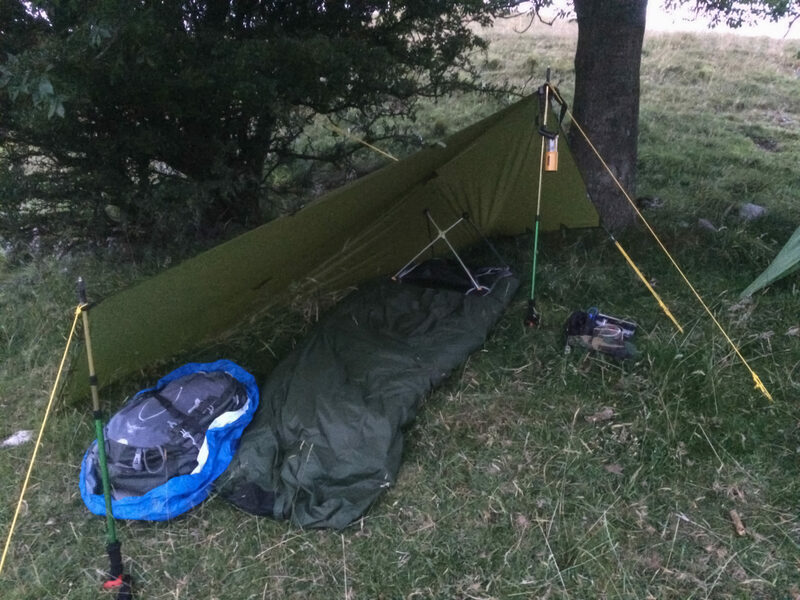 The setup I’ve used with this quilt is in conjunction with the Alpkit Hunka XL bivvy and the Thermarest Venture mat. For me this is the best combination I’ve tried as these items all pack down small, light and provide a large enough sleeping system for my large(ish) body. The quilt comes up to just above my eyes if I’m lay flat on my back, if slept on my side and slightly bent my legs it would cover my head completely. I tend to wear a hat or a balaclava in winter anyway so this isn’t a problem for me. The times I’ve tested this I’ve slept just in my boxers which is how I prefer to sleep rather than clothed. I’ll update this review once I get chance to test this in winter. For me this is the best sleeping kit I’ve ever used, I’m really happy with it and will now never use a sleeping bag ever again. I’ve never slept so well while wild camping!